In the Sikh Movement for Freedom, one name which appears with high regard in the Majha area of Panjab is that of Shaheed Bhai Waryam Singh Booraynangal. Bhai Waryam Singh was born in village Booraynangal, situated a few miles from Gurdwara Achal Sahib (built in memory of Guru Nanak Dev Ji) in district Gurdaspur. Bhai Waryam Singh was born to Sardar Nazar Singh and Bibi Swaran Kaur in 1971 and was the youngest of 3 brothers. Bhai Waryam Singh completed his primary education at the nearby village of Rangarhnangal, after which at the age of 12 years became a student at Damdami Taksal. Whilst studying at Damdami Taksal, Bhai Waryam Singh became greatly influenced by Sant Jarnail Singh and took Amrit during his stay here. Bhai Waryam Singh began santhiya (correct pronunciation) of the Nitnem Bani’s and very quickly learned the 5 Nitnem Banis as well as Asa Di Vaar & Sukhmani Sahib by heart. Bhai Waryam Singh was also given santhiya of the entire Sri Guru Granth Sahib on 2 occasions by the Damdami Taksal teachers. During these days, the June 1984 attack on Sri Darbar Sahib, code-named Operation Bluestar, took place which shook the Sikh Nation to the core. Bhai Waryam Singh only aged 13 at the time also felt the impact. Bhai Waryam Singh felt that the Indian Government had issued a challenge to the Sikh Nation, and it was time for the Sikhs to respond. Bhai Waryam Singh and Bhai Sukhwinder Singh aka Ladoo Sirhind were eager to carry out actions against the security forces who had swarmed Punjab, however with no weapons and no training this was not possible, thus both Singhs left for Pakistan where Jujharoo training camps had been set up. Upon crossing the border into Pakistan, Bhai Waryam Singh & Bhai Sukhwinder Singh were caught by the Pakistani Army, and imprisoned. Baba Gurbachan Singh Manochahal heard the story of the Bhujangi Singh, and ordered for his release. This led to Bhai Waryam Singh joining the Bhindranwale Tiger Force of Khalistan, under his leadership. Often when the Jujharoo group were residing at a hideout, the residents would point at Bhai Waryam Singh and ask Baba Manochahal “who is this Bhujangi?” Baba Manochahal would then introduce the family to Bhai Waryam Singh and say “although young in age, his actions are very big”. Bhai Waryam Singh had not even yet developed any facial hair when he joined the ranks of the Jujharoo Singhs, due to which he would sometimes be disguised as a girl to pass the security forces checkpoints and relay information to the Jathebandi Singhs. When Sant Jarnail Singh voluntarily courted arrest on September 20, 1981 in connection with the murder of Lala Jagat Naryan, a comrade from Mehta Chowk area on the instructions of the Government gave evidence against Sant Jarnail Singh. The case was later thrown out due to insufficient evidence, but the comrade had ultimately signed his own death warrant. Bhai Waryam Singh was staying in room number 13, beside Sri Akal Takht when he was assigned his first mission. Bhai Waryam Singh and Bhai Daswandha Singh Basarke hunted and gunned down the comrade along with his bodyguard. Upon completion of this mission, Baba Gurbachan Singh Manochahal promoted Bhai Waryam Singh and and assigned him the duty of gathering and distributing weapons amongst the Jathebandi Singhs. Whilst occupying this duty Bhai Waryam Singh came into contact with the highly regarded Jujharoos of the BTFK such as Bhai Surjeet Singh Behla, Bhai Jagtar Singh Bhorshi, Bhai Sukhdev Singh Maddi, Bhai Gurmej Singh Geja & Bhai Daya Singh Chohla Sahib. Bhai Waryam Singh was respected by all Jujharoo Jathebandis (Militant Groups) and also took part in missions alongside the Singhs of Khalistan Commando Force and Khalistan Libertion Force’s Nishan Singh Makhu. Bhai Waryam Singh was particularly close to the Khalistan Commando Force due to his time spent at Mehta Chowk, as the majority of students from Damdami Taksal had gone onto join the ranks of Baba Manochahal’s BTFK or the Khalistan Commando Force. Shaheed Bhai Sukhdev Singh Jhamka & Shaheed Bhai Harjinder Singh ‘Jinda’ Aadowali both of the KCF had great admiration for Bhai Waryam Singh. Still in his teens, Bhai Waryam had become a fearless soldier under the guidance and leadership of the Jathebandi General Baba Manochahal. 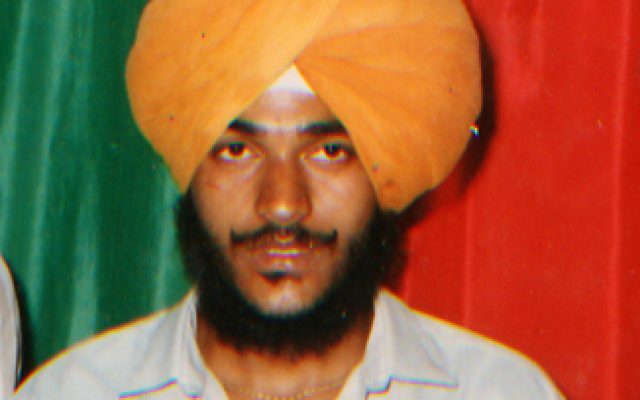 Bhai Waryam Singh was not afraid to take on the security forces single handedly, which he showed in a shootout at village Jandiala Guru, Amritsar. Bhai Waryam Singh had been waiting the arrival of his fellow Singhs as he spotted the Hindustani forces vehicles approaching. Bhai Waryam Singh advanced opening fire at the incoming vehicles before making his getaway. The firing also alerted the Singh’s who were en-route to meet Bhai Waryam Singh and they too managed to get away safely. Bhai Waryam Singh spent time doing Seva and in the state of Uttar Pardesh (UP), before returning to Punjab a few months later. Bhai Waryam Singh’s name was mentioned throughout the newspapers of Punjab with links to actions taking place, even Intelligence Bureau chief Maloy Krishna Dhar makes mention of Bhai Waryam Singh Booraynangal in his book titled ‘Open Secrets’. During the peak time of the Sikh struggle, the Indian Government was trying its best to malign and infiltrate the movement, and as such equipped and entered their own agents (CATS) within the Sikh Jathebandi’s. One such officer was Inspector Gurnam Singh aka Dr Rana, who had a group of 10 CATS operating under him. One Police CAT from village Keerhi, district Gurdaspur named Daljit was ordered to infiltrate the BTFK group to feed back information on the hierarchy of the group. His prime objective was to rise through the ranks and eventually kill BTFK chief Baba Manochahal. On one instance, Daljit CAT along with Bhai Waryam Singh & Bhai Surjit Singh Behla were traveling via motorcycle to meet Baba Manochahal when suddenly they were fired upon by the CRPF. Both Bhai Waryam Singh & Bhai Surjit Singh Behla returned fire and a lengthy encounter took place in the middle of the night. Eventually the Tiger Force Singhs managed to break the cordon and escape. After this incident a meeting took place and suspicion arose on Daljit CAT as he was reluctantly firing back during the encounter and was one of the few people who knew of the route the Singhs would be traveling. Upon investigation into the matter, it became clear of Daljit’s treachery and he was punished soon after. Bhai Waryam Singh was completely dedicated to the Sikh Freedom movement, he had left his family behind and only met with them if an urgent situation arose. Even then he would only meet for a few minutes before leaving for his next destination. One time Bhai Sahib’s mother brought up the subject of marriage, Bhai Sahib simply replied “I am married to my Shastars now”. After the death of Daljit CAT, Inspector Gurnam who operated as a weapons dealer under the name of Dr Rana sent a message to Bhai Waryam Singh to arrange a meeting regarding supplies of arms. He stated that Bhai Sahib come alone and unarmed. At this point, Dr Rana had made himself familiar with the BTFK Singhs and his connection to Daljit CAT was unknown to Bhai Waryam Singh. The meeting took place at the home of Nirmal Singh from village Kaka Kandhiala, situated at the side of Tarn Taran. As Bhai Waryam Singh entered the home, Dr Rana’s group of CAT’s surrounded then restrained him, before turning Bhai Waryam Singh over to the Tarn Taran police. During interrogation Bhai Waryam Singh was asked about the locations of the top BTFK Singhs. Bhai Waryam Singh worked out a scheme in order to alert the Jathebandi Singhs of his capture. He revealed to the police that a meeting of all top BTFK operatives was due to take place at a Gurdwara in village Rataul (Tarn Taran). Immediately SP Harjit Sio along with the CRPF surrounded Gurdwara Bhai Maha Singh in Rataul. All throughout the night the CRPF remained stationed here but nobody had entered nor left. In the morning the Tarn Taran police took Bhai Waryam Singh to Rataul village and when they entered the Gurdwara Sahib only the Sewadars of the Gurughar were present. Furious with Bhai Waryam Singh for wasting their time, the Punjab Police too him back to the interrogation centre, where he was inhumanely tortured for information of BTFK Chief Baba Manochahal’s whereabouts. On the other side, Bhai Waryam Singh’s plan had worked, his visit to the village with the police had alerted the villagers of his arrest and quickly the news reached back to the BTFK Singhs. In order to free their Lt. General, the BTFK Singhs began a series of high profiled kidnappings. These included the brother of Amritsar’s DC, the son of a DSP, a close acquaintance of SSP Swaran Ghotna, the father of senior police official Mehal Bhullar and a close acquaintance of Minister MS Gill. However, Bhai Waryam Singh had attained Shaheedi at the hands of Punjab Police whilst in custody. The DC of Amritsar held a press conference in which he showed photographs of Bhai Waryam Singh’s body and urged the BTFK Singhs to release their hostages. Many of Baba Manochahal’s close associates were released from jails in return for the BTFK Singh’s to release their hostages. Dr Rana’s close acquaintance Nirmal Singh was punished by the BTFK Singhs for his role in Bhai Waryam Singh’s capture. On the 1st Shaheedi anniversary of Bhai Waryam Singh held in his village Booraynangal, sangat attended in large numbers despite the harassment and deterring presence of the CRPF. Baba Thakur Singh whom often listened to Bhai Waryam Singh’s recitations of Bhagat Kabir Ji’s Saloks with affection during their time at Damdami Taksal visited with along their Jatha to pay homage to Bhai Waryam Singh and a Kavishri Jatha sung the ballads of Bhai Waryam Singh’s courage and sacrifice.